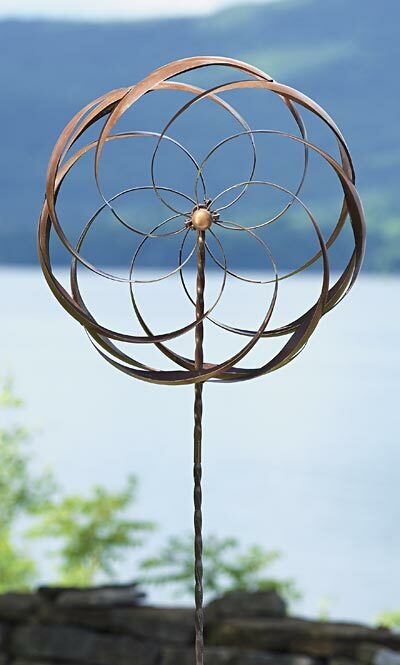 Create a unique flower display in your landscaping with the Ancient Graffiti Kinetic Staked Flower Spinner. This tall sculpture brings an exciting look to your garden, and its moving accents will certainly create a focal point. The two, 20" diameter toppers evoke flowers, with their curving arms and rounded shapes. The petals attach to each other for a full design, while their brown hue accents your garden and soft green highlights add contrast. Each of these toppers attaches to the 64" tall post, with a matching brown and green finish for a cohesive look. The twists along the center shaft further the spinning theme, and the arch in each petal shape helps it move in a breeze. Made of lasting iron, this dramatic adornment will remain lovely for many seasons in your backyard, with fantastic weathering over time. Its 15" wide, trident base and 7.75" long legs with pointed ends ensure the item installs in soil with ease, and remains stable and lovely. Combine natural shape with industrial material in a fun way with this Kinetic Staked Flower Spinner. Assembly required.